The Chestnut Two-Stall Barn is a 20'x24' pole- barn with a loft, two stalls and a big Alley for storage and grooming. Dutch stall doors and big, sliding alley doors add to your convenience. 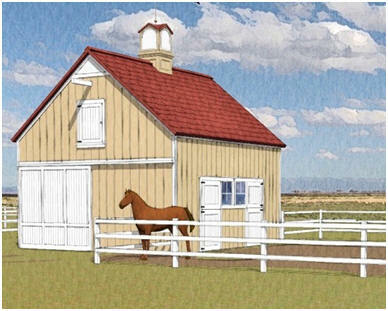 The standard drawings include more stalls, shelters, run-ins, sheds or garages that you can build on the sides of your barn as your needs grow. Floor Area: 480 Sq. Ft., Loft Area: 480 Sq. Ft.